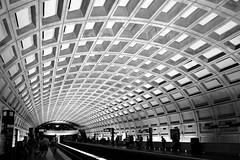 Thanks much to the guys at Echo Ditto, the iPhone-optimized Metro Train site is back in action. If you’ve got an iPhone, you can now get live train locations through the website, which is great news for above-ground folks. Just wait until October when AT&T comes to the Metro. That’ll be a great day. This works great on the Palm Pre too (which has coverage via Verizon roaming) in the Metro tunnels. …also works great on a Blackberry Storm, which has straight-up regular Verizon coverage underground. Although, I typically use this kind of information as I’m getting close to the station to know if I should hurry or not.